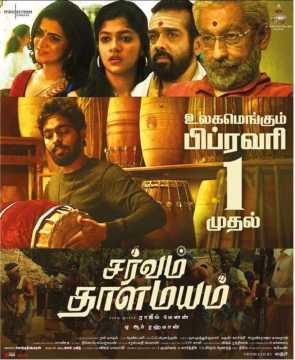 Sarvam Thaalamayam works both as an entertaining musical drama and as an allegory about classism and casteism in music. Cinematographer-filmmaker Rajiv Menon has returned to direction after 17 years with GV Prakash Kumar-starrer Sarvam Thaala Mayam, and it’s amazing how, despite being out of action for so many years, his work is still relevant even today. His latest outing — about a dalit boy’s dream to play in Chennai’s carnatic music festival, is the best example. The film fittingly works both as an entertaining musical drama and as an allegory about classism and casteism in music, particularly in the Brahmin-led carnatic music scene. It’s really worth mentioning that over the last few years there has been a lot of media coverage on the of caste tension that underlines music and the people playing it. Without really pointing fingers and taking sides, Menon takes us on a musical journey that is set in world where the lives of renowned mridangam player Vembu Iyer (Nedumudi Venu), an expert mridangam maker Johnson (Kumaravel) and his son Peter Johnson (GV Prakash Kumar), a crazy Thalapathy Vijay fan, cross paths and the events that follow form the crux of the story. In what can easily be described as one of his most earnest performances, Prakash as Peter Johnson plays the character with the kind of ease that’s never been displayed before. He’s never looked so comfortable on screen in a long time and this character is also a timely reminder that Prakash as an actor can go beyond than just doing crass adult comedies. From the way the story takes shape, the film initially felt like it would focus a lot on the guru-sishya relationship between Iyer and Peter. It’d have been really interesting to see what would’ve happened if Iyer denied teaching Peter and the latter went on to teach on his own by observing his guru. The film does take a needless detour as it ventures into the reality show space and this is where the story loses its novelty and leaves one slightly disappointed. While it can be argued that the reality show portion may have been included to appeal to the masses, it doesn’t deny the fact that it makes the latter portion of the film quite predictable. Nedumudi Venu as Vembu Iyer is brilliant and he makes the character chirpier than anyone can imagine. He gets everything about his character pitch perfect. From the accent to the personality and the occasional digs at the current music scenario; he nails the part with grace. Vineeth, Kumaravel and Aparna Murali play their respective roles quite convincingly. The film works largely due to its casting and all credit to Menon for picking the right actors. Composer AR Rahman's music is the film's lifeline and he delivers one of his best soundtracks of recent times. When it comes to the songs, 'Varlaama' track beautifully resonates the theme of the film and it serves as the anthem of the oppressed. The title track is beautifully shot and it captures the journey of self-discovery of a musician who is struggling to find inspiration. In spite of its flaws and a very predictable ending, Sarvam Thaala Mayam is a very important film in today’s times. It makes us realises that art doesn’t differentiate people based on their class and caste. The film, which is elevated by Rahman’s lilting music and memorable performances by the ensemble cast, works mostly because it never sensationalizes what it sets out to achieve.